If one were to state succinctly the predominant supposition that underlies all modern thinking and action regarding human societies it would be that God has no absolute rights over the laws and governments of men; that men are sovereign over their own lives both individually and collectively. This is the antithesis of reality. It is the devil’s doctrine. “You shall not die the death.You shall be as Gods!” This was the first lie and it is still the most destructive. Belief in that lie is almost universal today, both in thought and in practice. God is the Creator, Sustainer, Redeemer, Savior, and Sanctifier of all men. All men belong to God and we owe him our love and obedience in every aspect of our lives. Jesus Christ the God-Man is our King by every conceivable right and title, both human and divine. He has the RIGHT to be obeyed and honored by all human societies, especially governments. The Rights of Man are all subject to those of Christ the King, and all so-called ‘human rights’ will disappear if God’s rights are not properly honored by society. Foreward . . . . . . . . . . . .
Introduction . . . . . . . . . .
Chapter II: Necessary Consequences of that Created State Which is the Essence of Human Society . . .
Chapter III: The Sovereign Lordship of Jesus Christ Over Every Society and Every Nation . . . .
Chapter IV: The Conditions and Exact Meaning of the Kingship of Jesus Christ . . . . .
Chapter VI: Power of the Church in the Social Order Established by God . . . . . . .
Chapter IX: The Sin of Liberalism: the Sin of Europe and of the World . . . . . .
Chapter X: Punishments Inflicted by God On Countries Which Abandon Him . . . . .
Chapter XI: Remedy For Present Ills . . . . .
Chapter XII: Action . . . . . . . . .
Quas Primas: Encyclical Letter of Our Most Holy Father Pope Pius XI . . . . . . . . . Appendix I: Letter from Cardinal Gasparri to Rev. Father A. Philippe . . . . . . . . 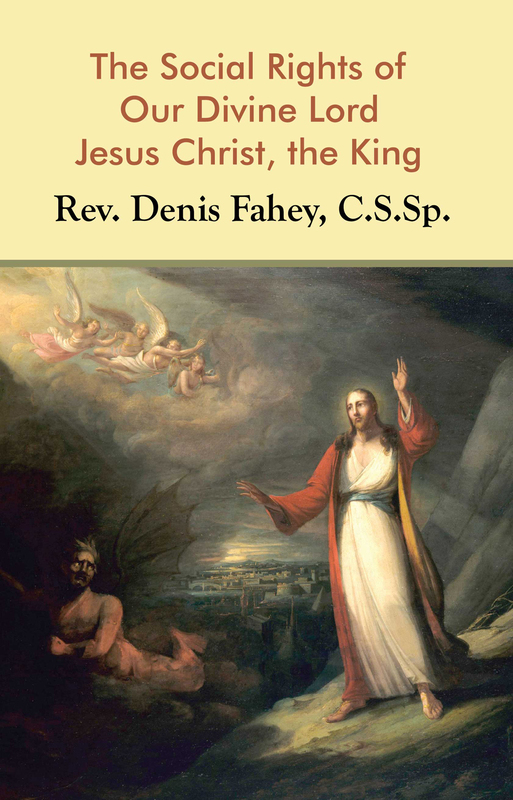 Appendix II: The League of the Kingship of Christ . . The Semaine Catholique, which was organized at the beginning of 1926, expressed the desire to have a clear statement of the doctrine of the Kingship of our Lord Jesus Christ in catechetical form. The work, of which an adaptation is here presented in English dress, was undertaken by the Rev. A. Philippe, C.SS.R., in order to meet the wish thus expressed. In less than six months the first edition was sold out. This adaptation is made from the second edition. It has been thought better to omit the question and answer form of the original work, and to recast the author’s words in the shape of a conversation between a teacher and an earnest seeker after truth. The latter may be taken as representative of the educated layman, who is puzzled by the statements he meets with in the newspapers and in current literature, and who wants to have a clear grasp of the order of the world. The teacher accordingly exposes the Catholic doctrine on the Rights of Our Lord Jesus Christ in society. It is hoped that the present form, while losing none of the accuracy of the original Catechism, will be found more vivid and less pointedly didactic. In Chapter XI, where our co-operation with our divine Lord Jesus Christ is treated of, a number of passages from the Encyclical Letter of Pope Pius XI, On Universal Reparation to the Sacred Heart, published after the appearance of the French original, have been inserted. The official teaching of the Vicar of Christ will bring home to every Catholic the importance of the doctrine set forth. In Chapter XII, as well as in earlier chapters, many points have been given a more extended treatment, owing to their importance for Irish Catholics. In order to increase the usefulness of the work, I have thought it well to add a special chapter on the Declaration of the Rights of Man of 1789. During my college and university courses I suffered from the lack of books giving the integral truth about the real history of the world. In the hope of sparing similar suffering to others, I have insisted on the significance of the Declaration. Imperfect though the chapter is, it will be of help in understanding that history is unintelligible, if it is not the account of man’s forfeiture of supernatural life and his restoration thereto by incorporation into the Mystical Body of Jesus. If the knowledge that we are fighting a stern battle, under the banner of Christ the King, Who came down to lead our fallen race to victory, helps to fire with enthusiasm for the great cause even a few young Irish hearts, I shall be amply repaid for the labor involved in this little work. Grateful thanks are due to Messrs. Browne and Nolan for permission to add on the translation of the Encyclical Letter, Quas Primas, of His Holiness Pope Pius XI, published by them. The translation used for the Letters of Pope Leo XIII is that published by Benziger Brothers. Where no indication is given, in the case of other Pontifical Letters and Documents, the translation has been made directly from the original text. Two Appendices have been added. One gives the Letter of the Cardinal Secretary of State of His Holiness Pope Benedict XV, to Father Philippe, C.SS.R., in praise of the Apostolic League founded by him for the promotion of the Kingship of Christ. The other contains an account of An Rioghacht, the League of the Kingship of Christ, founded and directed by Rev. E. Cahill, S. J.